Every year, more than 50,000 domestic relations cases are filed in Arkansas. Nine out of every ten of these cases involves at least one person who does not have a lawyer. Similar trends can be seen in cases involving housing, wills and estates, and debt collection cases. Only about 3000 Arkansas attorneys are currently in private practice and available to even handle cases like this. Under these conditions, it would be virtually impossible for everyone with an active case who needs legal advice to actually get it. In recent years, more and more people have turned away from lawyers and instead sought information and legal forms online. People often pay hundreds of dollars to online services that provide documents that turn out to be legally deficient. The desire for upfront, transparent pricing and for options that allow people to handle simple matters themselves is driving a new kind of legal market–one that is leaving the legal profession behind, to the detriment of consumers and our system of justice. 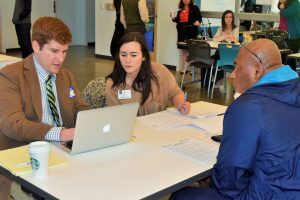 For these reasons, the Arkansas Access to Justice Commission, through special Task Force on Self-Represented Litigants, has spent the last four years researching rules in other states, gathering Arkansas-specific data on self-represented litigants and market trends, drafting rules, and sharing those drafts with attorneys and judges all over the state. 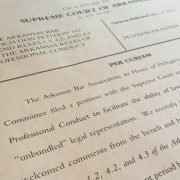 The recommended rule changes that the Arkansas Supreme Court has released for public comment represent four years worth of work toward a solution that we believe will make legal services affordable to many people who are currently priced out of the market, will allow cases involving self-represented litigants who use limited scope legal services to get resolved more efficiently and on the merits, and will open a new market of paying clients to attorneys. The Arkansas Supreme Court has issued a per curiam order seeking comments from the bench, bar, and public on proposed rule changes to the Arkansas Rules of Civil Procedure. Rules 11 and 64 would be modified and a new Rule 87 would be added. The Arkansas Access to Justice Commission drafted the rule changes with the goal of increasing access to justice by explicitly authorizing “unbundling” of legal services. (Read more about unbundling.) The Commission strongly encourages the public to submit comments for the Court’s consideration. The exact text of the proposed rule changes can be found here. Below is a brief summary of the changes proposed. The proposed changes would also allow an attorney ghost writing pleadings for a client to rely on the client’s representation of facts unless the attorney has reason to believe the representation is false or materially insufficient. The proposed changes to rule 64 are limited to adding a reference to the proposed Rule 87 and making technical corrections to make pronouns inclusive of both genders. The addition of Rule 87 would establish procedures for how an attorney withdraws from a case when the attorney and client have agreed that the representation is limited to only part of a case, as permitted by Rule 1.2(c) of the Arkansas Rules of Professional Conduct. The proposed changes represent a win-win-win for the public, courts, and attorneys. By clarifying the procedures for attorneys who offer unbundled legal services, more attorneys will feel comfortable offering this option to clients. 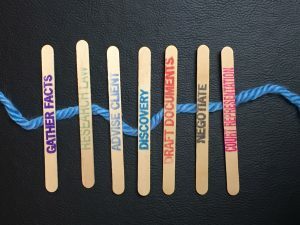 Unbundled services allow a lawyer and client to agree that the lawyer will handle certain parts of the case and the client will be responsible for other parts of the case. 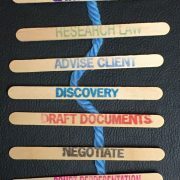 For example, a lawyer and client might agree that the lawyer will prepare a divorce complaint for the client and advise them about how they should proceed to get their divorce decree or they might agree that the lawyer will represent the client at one hearing while the client remains responsible for the rest of the case. Existing rules require that attorneys who provide limited scope representation only when it is appropriate under the circumstances, which means that limited scope representation is usually NOT going to be an option for complicated cases or unsophisticated clients. This has the effect of increasing access to justice because attorneys who offer unbundled services charge fees that reflect a discrete amount for a discrete aspect of the case. Such fees, though commensurate with the amount of time an attorney puts in, are typically much more affordable than full-service fees. This means that more people can afford legal representation. This not only improves the outcomes in individual cases, but also helps our courts to run more efficiently. Lawyers are also able to offer their services to people who previously wouldn’t have gone to them for help. Attorneys helping clients at a clinic at Our House. This clinic utilized unbundling, allowing the volunteer attorneys to help far more clients than they could have otherwise have assisted. Comments must be made by October 6, 2017. If you have questions or would like additional information about the rules or our research, feel free to contact us. Last month, the Arkansas Supreme Court issued an order adopting proposed changes to the Arkansas Rules of Professional Conduct that clarify the responsibilities of attorneys who offer their services to clients on a limited scope basis. Also known as “unbundled” or “a la carte” legal services, limited scope representation offers an affordable alternative to clients who cannot afford traditional full-service representation, opens up new business opportunities for lawyers, and facilitates greater efficiency in the court system. The rules went into effect on the day of the May 12 opinion. Modification to Arkansas Rules of Professional Conduct 1.2(c), 4.2, and 4.3 provides more explicit guidance for attorneys who provide limited scope legal services. Arkansas Rule of Professional Conduct 1.2(c) authorizes Arkansas attorneys to provide this form of representation. That rule provides that “[a] lawyer may limit the scope of the representation if the limitation is reasonable under the circumstances and the client gives informed consent.” Additionally, the revisions include the addition of language regarding when a client’s informed consent has to be in writing, as well as language clarifying an attorney’s communication responsibilities when the opposing party is represented by a limited scope attorney. Links to the revised rules can be found below, and sample Notices of Limited Scope Representation and Notice of Completion can be downloaded from the links below. The Commission is working toward seeking additional changes to Arkansas Rules of Civil Procedure to explicitly authorize the practice of ghostwriting and to permit attorneys who give proper notice of a limited scope arrangement in a court proceeding to be automatically relieved as counsel of record once the attorney has completed the limited scope representation. Drafts of those rules can be found here. Resources for attorneys, including a toolkit, forms, CLE training, and a client referral network are under development and will be made available as they are developed. 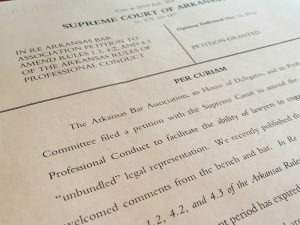 The Arkansas Supreme Court has issued an order soliciting comments from the bar and public regarding proposed changes to Arkansas Rule of Professional Conduct that would provide guidance for attorneys who wish to provide limited scope representation. Also known as “unbundled” or “a la carte” legal services, limited scope representation offers an affordable alternative to clients who cannot afford traditional full-service representation, opens up new business opportunities for lawyers, and facilitates greater efficiency in the court system. Arkansas rules already permit limited scope representation; the rules changes simply offer more clarity for lawyers who choose to engage in this form of practice. The revisions include the addition of language regarding when a client’s informed consent has to be in writing, as well as language clarifying an attorney’s communication responsibilities when the opposing party is represented by a limited scope attorney. Comments should be submitted in writing and addressed to Stacey Pectol, Clerk of the Arkansas Supreme, Court, Attn: Code of Professional Conduct, Justice Building, 625 Marshall Street, Little Rock, Arkansas 72201. The deadline for submitting comments is May 1, 2016. Last week, the American Bar Association passed a resolution supporting efforts of attorneys and of supporting institutions, such as bar associations and the judiciary, to increase utilization of limited scope representation as a means of increasing access to justice. Also known as “unbunding,” limited scope representation is when an attorney and client agree that the attorney will represent the client for certain parts of a case, with the client handling the rest. Examples include hiring a lawyer just for a consultation or hiring a lawyer just to prepare pleadings for a case. Arkansas’s limited scope rule permits an attorney to limit the scope of her representation if it is reasonable under the circumstances and the client gives informed consent. Unbundling works to increase access to justice by making legal services affordable for clients who have some reasources, but may not be able to pay for full representation. The Arkansas Access to Justice Commission unanimously supported passage of the resolution.